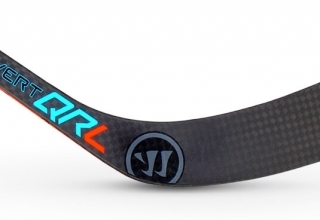 The QRL Pro glove is the newest “Pro” offering in the Covert line. 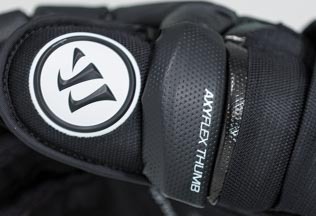 This glove picks up where the QR Pro left off and offers the new Axy Cuff design to help create additional mobility while still being very protective on the top and bottom of the wrist. These gloves have a tapered fit, which is tight in the fingers and loosens up a little as you move back. If you’re looking for the fit of a traditional 4 roll, don’t be discouraged yet, as they loosen up a bit after break-in. I’ll be comparing these to my old Eagle XP X70’s as we go along, so let’s get on with the tech stuff! 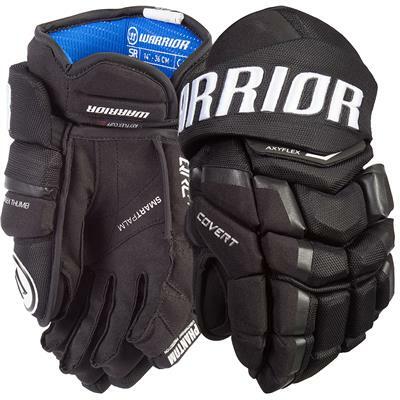 Warrior kept the FNC (Fresh and Clean) liner with Polygiene which helps keep the gloves dry. This tech also fights against bacteria to help eliminate the odor that can develop over years of playing with the same gloves. What I noticed most about this liner compared to my Eagle’s is that it’s very soft to the touch, almost silk like. I air my equipment out after every skate and so far I haven’t noticed any smell or odor build up from the gloves. This is important because I feel like these gloves run a little warm, which I’ll talk about later. 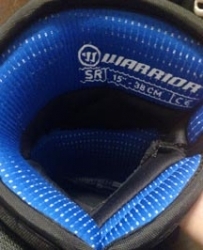 This is the same thumb as the previous model and one that Warrior is continuing to use throughout all of their glove lines, including the new Alpha line. The thumb has great protection on the back and awesome lock strength, but allows very good forward movement and bending. From my testing, I couldn’t make the thumb move backwards with any decent amount of force so it should provide an ample amount of hyper-extension protection. There’s also good protection at the bottom of the thumb to protect from slashes. This was also brought forward from the QR Pro and is one of the main reasons I choose this glove over the standard QRL. The soft palm material feels smooth, yet tactile and I can really feel the stick. They provide extra material through the middle and bottom of the palm to help reduce wear, but it doesn’t take away from the feel of the glove. 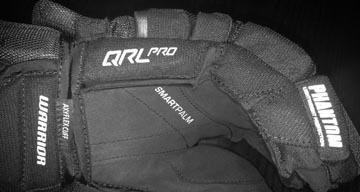 The QRL’s, on the other hand, have the smartpalm+ which has a rubbery grip laid on the bottom of the palm and for me it was just too much. 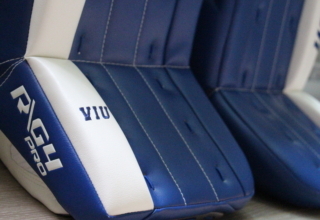 As I stated earlier, my biggest concern here was the gloves running a little hot due to the lack of mesh gussets. However, the Wartech liner does a fantastic job of drying them out and keeping them fresh. If you like a regular Nash type palm, the Pro version is the way to go. Even though my Eagle palms have been outstanding (12 years on the same ones without any holes), I really like the feel of these palms and I’m hoping they last just as long. This feature is what attracted me to the glove in the first place. The AxyCuff is a floating cuff that is attached to the glove via a spandex like material. This allows you full mobility while still being very protective on the back of your wrist. When I first put these on I wasn’t sure if the mobility was really going to be as good as they said, but once I started using them they surpassed my expectations. My Eagles had a shorter cuff and I was concerned that I wouldn’t have the same mobility because the Pro is longer. However, because the AxyCuff floats, it can move independently from the rest of the glove and maximizes mobility. For those that like to dangle and really like short cuffs, I think you’ll be pleasantly surprised with how these feel. 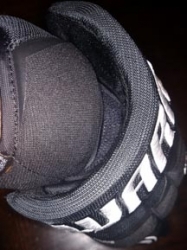 You can see how the cuff is attached with a spandex type of material below. 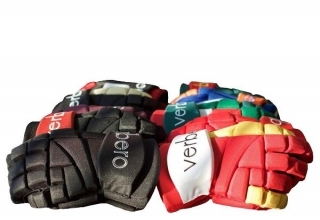 Price – $150 Cheaper than customs, standard QRL and Bauer 1x’s, but average compared to other top of the line gloves. Fit – Tapered and true to size. I wore a 15 in my eagles and stayed with 15’s in the QRL Pro’s. Protection – Ample protection, lightweight and great mobility. Segmented backhand allows natural hand movement you don’t get with 4 rolls. Durability – Three months of use multiple times a week and they are holding up well. No tears, rips or seams coming apart and the liner is just as soft as the first day. 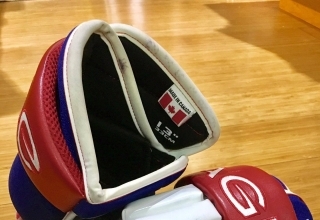 Changes – The only change I would make on this glove is to use the same mesh gussets as on the non-pro QRL. I believe that would increase breath-ability and help with them being a little warm when on. After over 3 months of use I’m happy to say that these gloves are holding up well. I really like the tapered fit of the glove and how light these are. Even though they run a little warm, I’ve been very happy with the feel, protection and mobility of this glove. If you’re already using a tapered fit glove, you need to check these out because I think for the price point, they’re the best glove out there. 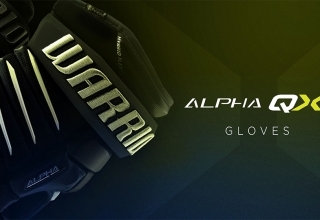 If you’re a 4 roll guy/gal, you may not like the fit and warmth of the glove, but stay tuned as Warrior is getting ready to release their new Alpha line that will be aimed at those players.